Sometimes I feel like there is so much information out there regarding this break through cleanser or the next groundbreaking serum that everything just gets lost in translation. I have built a real interest and passion about skin and skin care products over the last few years and have enjoyed researching and reviewing things across the market. 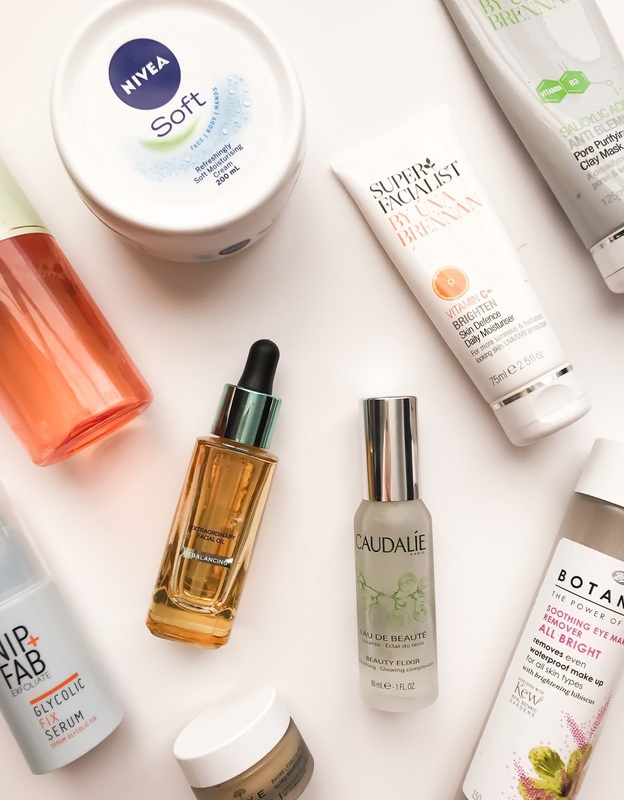 With this post I want to talk about budget skincare and what you actually need to be using not what the advertisers tell you that you need to be using. My interest has stemmed from having pretty uncooperative skin that is sensitive, dry and prone to eczema and dermatitis. I can't use a lot of heavy make-up as it doesn't wear well on me and feels uncomfortable. I found this really frustrating and decided to do some research into what my skin needed to function more normally and comfortably. The first thing I did was ditch the face wipes. I know they are convenient as hell, trust me I should have had shares with Simple I bought those green wipes so regularly, but they literally robbed my skin of the limited natural moisture it had and were definitely more of a hindrance than a help. I started to cleanse with a micellar water which was still pretty easy and I could see improvements slowly but surely. My real break through was when I took the hot cloth cleansing leap. Okay it takes longer, cleanser is arguably more expensive and yes it is a bit more effort, but it is so worth it. I noticed the difference in my skin almost instantly and I just feel cleaner and more rejuvenated. I then began to look into the best ingredients for my skin type and found hyaluronic acid which can retain over a 1000 times its weight in water within the cells of the skin, which makes it a really excellent moisturiser for my dryer skin. I also feel like something which isn't overly scented is really important if you have a more sensitive skin. Finally in a day cream you really want some sun screen in there and if not then you should apply that under your make-up or ensure it is in your primer or foundation. Finally I want to provide a list of products that I think are truly brilliant and great value for money. As with anything there are certain things you should spend a little more on such as serum but moisturisers and cleansers can be found a lot cheaper on the market. Skin Renew Cleansing Oil by Una Brennan - Great nourishing oil that takes make-up off beautifully and leaves skin feeling lovely £10.99. Botanics All Bright Soothing Eye Make up Remover - Takes eye make up off really quick and easily and is brilliant value for money £3.99. Garnier Micellar Cleansing Water - Lovely, gentle water that removes make-up really quickly and at the price you can't go wrong £3.33. Pixi Glow Tonic - Brightens, tones and conditions your skin and contains amazing ingredients, plus its large size means it is great value and lasts forever £18.00. Salicylic Acid Anti Blemish Clay Mask by Una Brennan - Amazing mask for a bad skin day that can be used weekly or in an emergency, 125ml of product for only £9.99. Garnier Moisture Bomb Tissue Mask - The most inexpensive way to pamper yourself and nourish your skin at only £0.99 you can't go wrong. Indeed Lans Hydraluron - This product is great to layer on top of moisturiser as it provides long-lasting hydration to the skin and is lightweight while targeting dryness £24.99. Nip and Fab Glycolic Fix Serum - It contains 4% glycolic acid which helps to retexture the skin and improve the skins appearance £15.99. Nivea Soft Cream - A beauty classic that my mum has used for years and passed to me. It never fails me and makes my skin feel moisturised and soft and only costs £4.29 for 200ml. Vitamin C Skin Defence Daily Moisturiser by Una Brennan -It contains Hyaluronic Acid, anti oxidant rich Ferulic Acid as well as Vitamin C which helps to protect, brighten, nourish and resurface the skin £16.99. Caudalie Beauty Elixir - A gorgeous spritz that contains beautiful essential oils that enhance the skin and calm the mind. A beautiful pick me up when the skin needs some help through the day £12.00. Nuxe Reve de Miel Lip Balm - The ingredients including honey and precious oils help to nourish and protect the lips, I use this daily £9.50. Loreal Paris Extraordinary Rebalancing Facial Oil - This oil is great value for money and helps to calm and soothe the skin whilst helping to add moisture £19.99. I hope these product and tips can help make the idea of skincare easier to add into day to day life. Looking after the skin on your face is so important and will make you feel 100 times more confident in any walk of life. I have used Nivea on my skin for years and it why my skin is so soft I think. Well, apart from on really cold days. I've really enjoyed reading this post and I've picked up some great tips. I struggle with my skin being dry and dull, especially during the winter months. I'm going to try some of your advice. I've got to admit I do fall back on face wipes quite often as well- even though I know it's not good for my skin and I hate the waste! I am terrible for following a good cleansing routine and I hate to admit but I rely heavily on those wipes!!! Your tips are great and I need to follow them badly. My wife has really dry skin, and it seems like my daughter might have it to. Will have to try these. Thanks. That's interesting. I don't actually use wipes but the hot cloth cleansing sounds interesting. I try to do at least 1 if not 2 masks a week. These are great skincare tips and great products!! Its so important to have a good skin care routine to keep your skin healthy. I love trying new skin care products for me is a constant search for what works best for me. I love Caudalie products. They feel so good on my skin. I find Nivea a bit to heavy for my face but for those dry patches on arms and legs it is brilliant. I use a face mask with volcanic rocks that warms up in contact with water. I love it and it leaves my skin so soft. Great products and routine. I struggle with a proper routine when I get really busy but this has reminded me I should work that little bit harder at being good to my skin. I needed a post like this so bad! I'm useless with looking after my skin so this will really help! Like you, I ditched the wipes, I think they just strip a layer of skin off - not good. I see quite a few things that I need to give a try! Especially that Caudile spray. Whether you call it 100% pure skincare or holistic skincare or natural skincare or organic skincare, what people are looking for is skincare products that don't contain harmful ingredients.